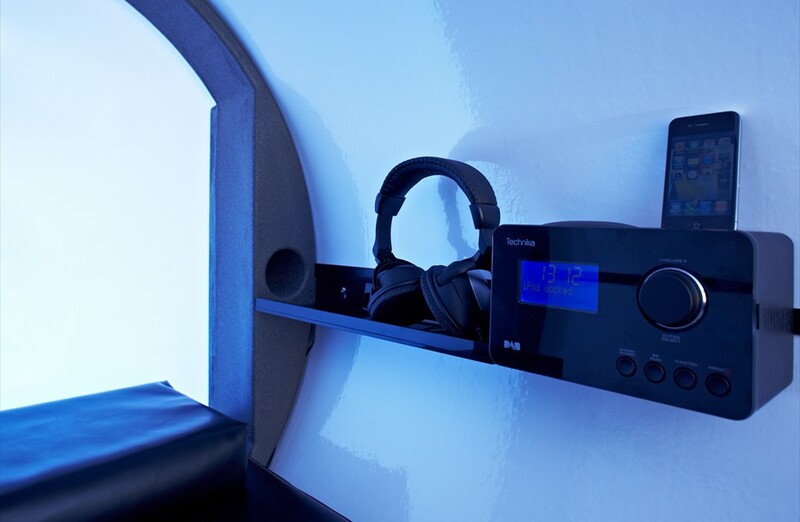 Podtime, the first of its kind in the UK, makes it easy for people to take a short period of rest during the day. 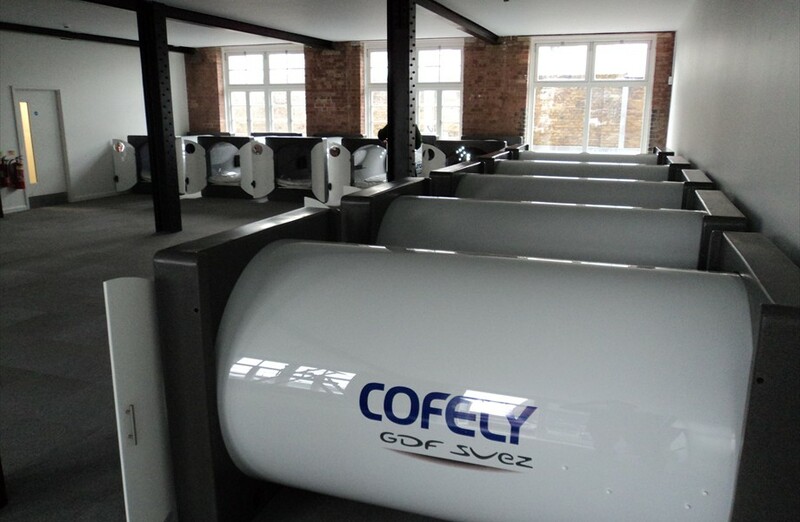 The enclosed pods are fitted with a high quality, comfortable mattress and pillows and are peacefully quiet, providing the perfect conditions to re-energize and get back on track after that stressful meeting or tiring business trip. It’s midway through work and you’d like to take a short nap during a break, but you don’t want to take just any ordinary nap. Then you’d probably love napping sci-fi style in a nearly indestructible polycarbonate tube with frosted doors equipped with the latest technological advancements. If that’s the case, check out Podtime Sleeping Pods! Podtime was founded by English entrepreneur Jon Gray, who spent much of his London career at Merrill Lynch, and knows only too well how demanding the lifestyle can be, as well as the benefits of a little rest. Gray says ‘Podtime was set-up to have a positive influence on people’s work at a reasonable price. Sometimes we all need a quick re-charge and now that service is available during the day, within minutes of all Bank workers.’ Gray plans to expand Podtime across the financial centers of London, with the aim to promote a healthier and more alert capital. 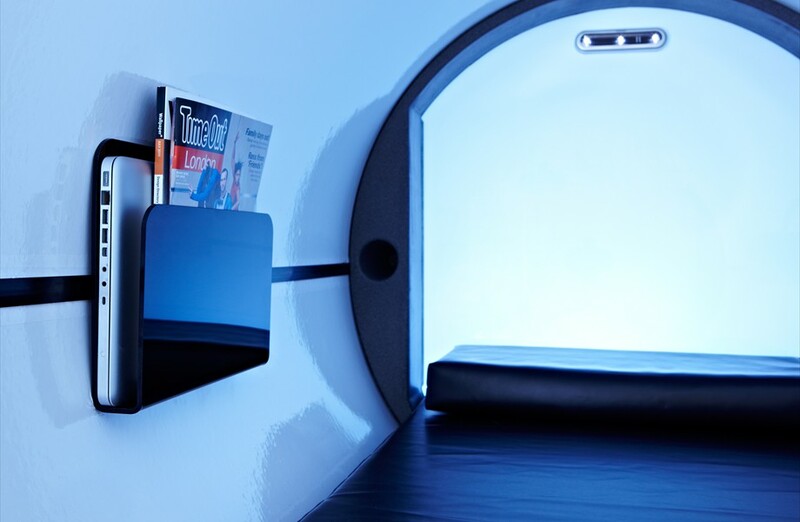 A $2,100 Podtime includes a high quality, comfortable mattress and pillows made to fit to the tube’s exact dimensions and “outstanding air circulation”. 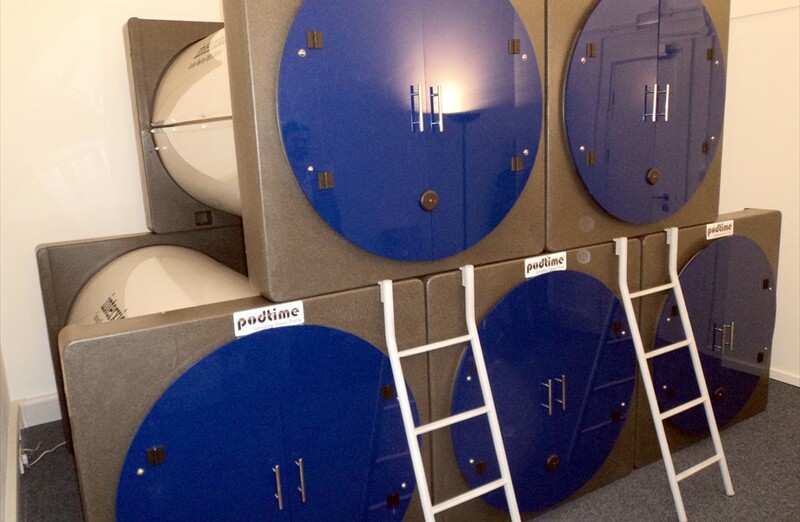 The Podtime sleeping pods fold down into flat packs for portability and storage. 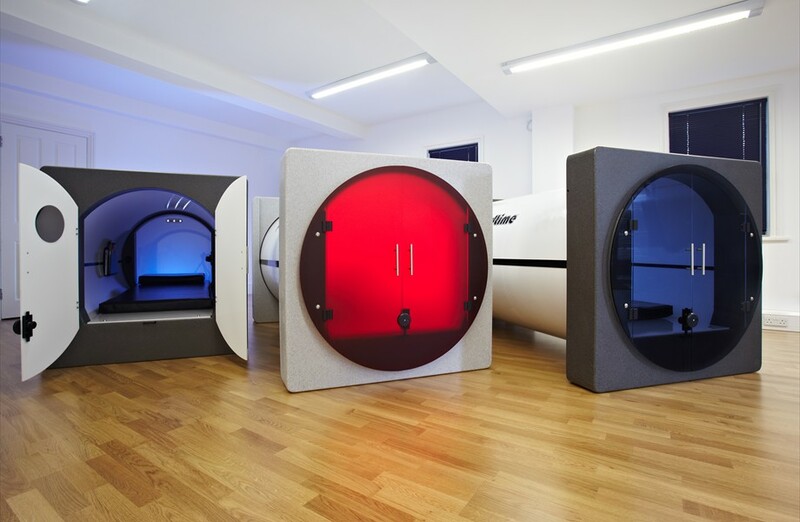 Since each sleeping pod weighs close to 220 pounds, you probably wouldn’t want to carry it around on your morning commute, but it could be moved around on occasion as needed. And if you’re one of those already thinking how these pods promote uniformity, think again! Podtimes are fully customizable. You can select from a variety of colors and addons such as a secret luggage compartment, TV, ear plug sets, foam and faux-leather covered mattress, and digital radio. 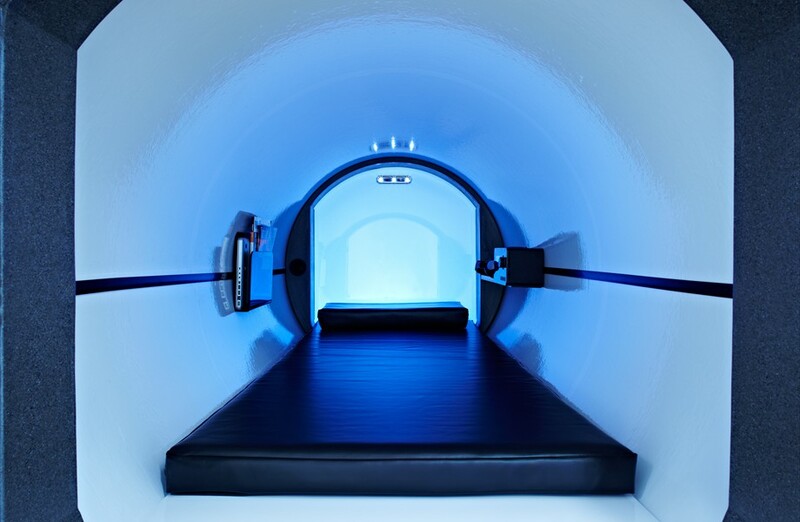 The pods themselves boast 15mm wall thickness to keep out noise and are ventilated to allow a flow of clean air. 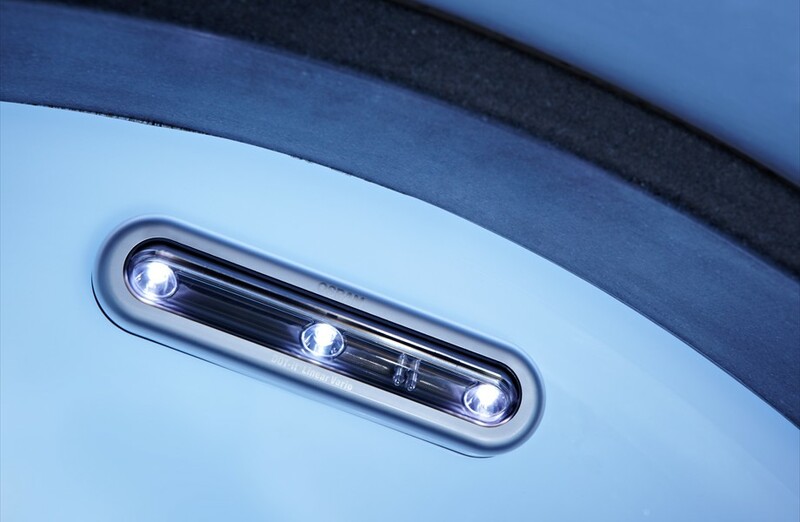 Other design features include a digital clock so that workers do not oversleep and the ability to lock the pod from the inside, ensuring that belongings are secure. 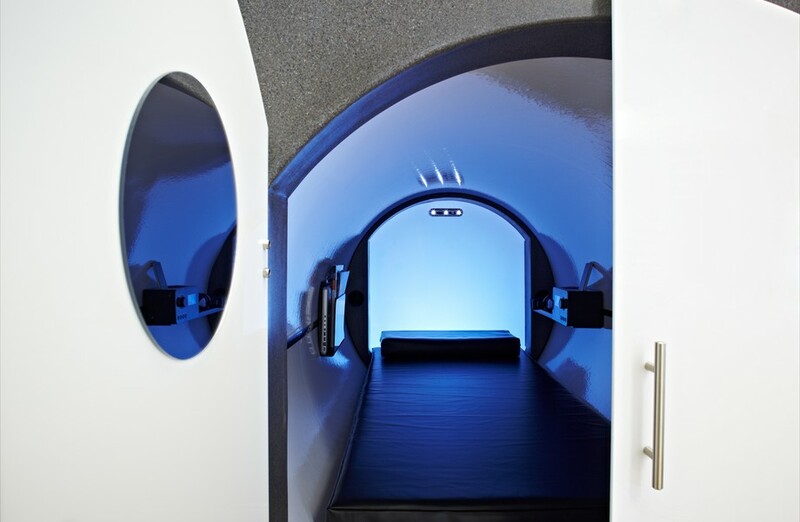 Well the next question I went ahead and asked myself was, “Who really needs an expensive sleep pod anyway?” Well you could make it your own personal office sanctuary for one. It could be the latest thing in luxury camping. 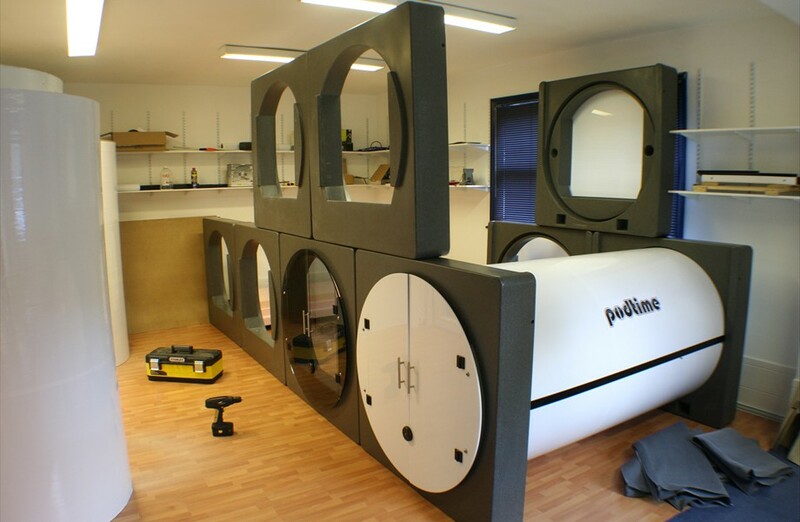 And since the pods are stackable, you would have some of the coolest bunk beds ever made. “Podtime and napping; this is definitely the way forward. As technology continues to develop at warp speed, we find ourselves increasingly limited in terms of how much information we are able to process on a moment by moment basis. The human brain, as sophisticated as might seem, is still developing its capacity to deal with the volume of incoming information traffic that we have to handle in our daily lives. I see the effects of this in my professional and clinical work as loss of productivity, insomnia, burnout and other serious health problems. Enlightened individuals and organizations will increasingly have to look for clever ways of going ‘offline’ in order to optimize productivity, health and wellness. Maybe businesses will even start to see that this is where a competitive advantage may lie,” says Dr. Nerina Ramlakhan, author of ‘Tired but Wired’. “I just wanted to say thank you for the service provided during our order. From order to dispatch and installation the service provided was exceptional. The Pods installed are well manufactured, solid and functional and when not in use can be easily dismantled quickly and stored away. The personalization service is also fantastic adding branded look to the Pods, by means of logos and color choice, a great cost effective design,” says Jay Vaghela, Building Surveyor of Telehouse. 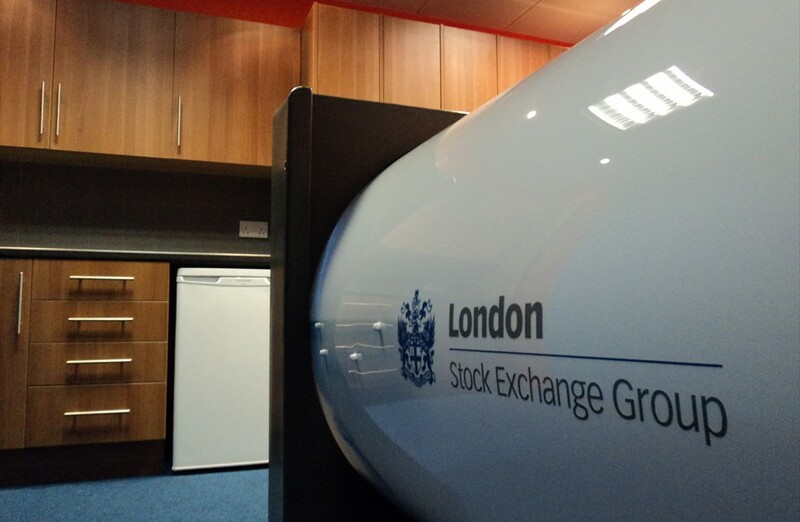 Already the London Stock Exchange has developed a ‘rest room’ area in the building which included pods as its main feature, along with kitchen, shower, lavatory and a small lounge. This installation allowed critical staff to stay over if necessary for transport strikes or emergency of some kind. Podtimes indeed offer a place to rest and relax for a short time during a particularly hectic or lengthy working day. 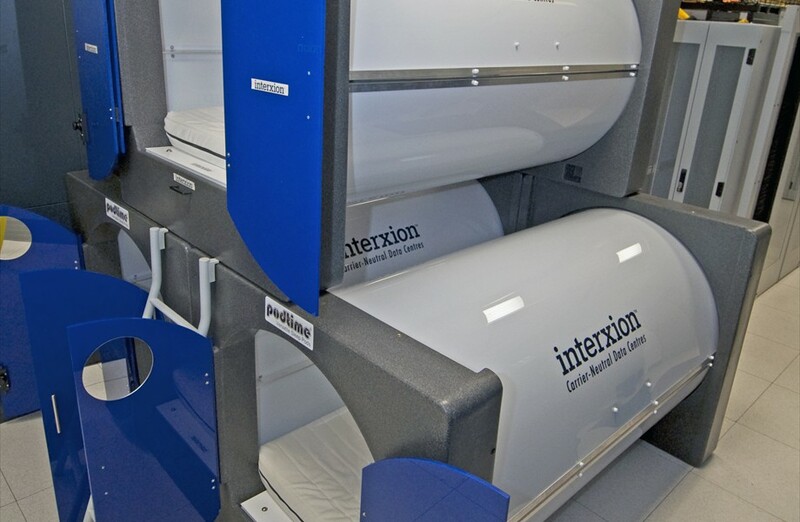 Another example of Podtime use is with Interxion, an international data center provider that needs staff to be onsite 24/7, and pods serve as part of their contingency planning. Such data centers host many vital websites so the company must be fully operational at all times, and they have a number of measures in place to allow staff to be on site to make sure none of their servers suffer any down time. 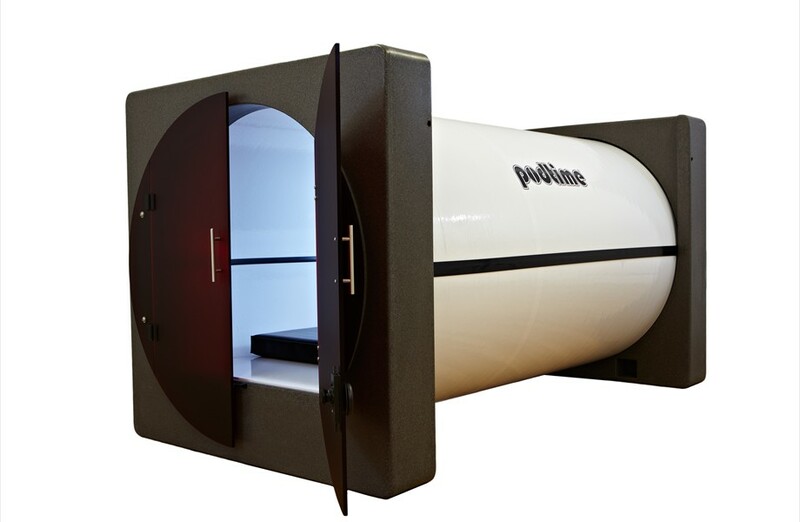 Podtimes give staff a comfortable sanctuary in privacy and security in an otherwise functional surrounding. There’s no mystery that anyone can strongly benefit from a good night’s sleep, but a busy lifestyle in today’s fast paced world can sometimes make it difficult to get your doctor’s recommended nightly amount of sleep. What’s great to hear is that there is another way to help your body recover itself to its full potential, even if your ideal period of night time sleep is lacking. 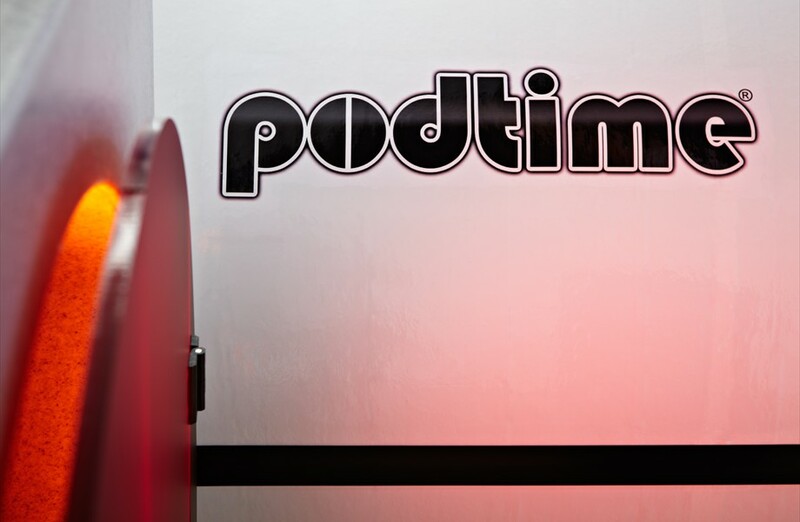 Podtimes allow you, your staff, and perhaps even your clients to take advantage of these benefits throughout the day with complete comfort and privacy – making your company a healthier, more productive system.